Message: In 1992 I had a very strange encounter in the woods near my home. What I saw at first, was a humanoid person sitting in a tree, but it looked wrong because it appeared to have only one long leg. My presence startled the creature and it moved with such speed that I didn't see where it had gone, but I was left staring at a male human being, who was standing by the tree. When I looked at him directly, the man suddenly disappeared. He had dark, medium-length hair, and a brilliant white shirt, and was about 5ft tall with his arms down. As I walked on, I saw him 5 -6 times along the path at varying distances, on either side, and found that I could control the image by looking at it only with peripheral vision. I then saw another shape behind me, of a 7-8ft tall, dark, grey, vaguely, human-shape with branches from the top of it's head, but it had no face! There was some missing time, and next thing, (although in the same place), I was looking into the large, black eyes of a being who was very old. I sensed great age about the being, as well as coldness or a lack of emotion. I can't remember anything else visual except the eyes: I realised it was absolutely real, then gasped inwardly and seemed to recover, yet with a feeling of indignance. Then I turned my back on it and continued on my way: I was now walking on a path that I didn't recognise, when I saw the exit to the woods and turned around when I reached it. As I looked, there was a wave or ripple of green coming very fast towards me, then a sudden wind as something passed through the treetops beside me. I had a euphoric sense of love, and of the oneness of the sap of the trees and the blood in my veins... and all life. I did not attempt to speak at all during the encounter: The being or beings were breathing air and I saw no craft and I believe them to be terrestrial. When I reached my destination, I discovered that I had taken over 3 hours, to complete what should have been a mere 15 minute walk! 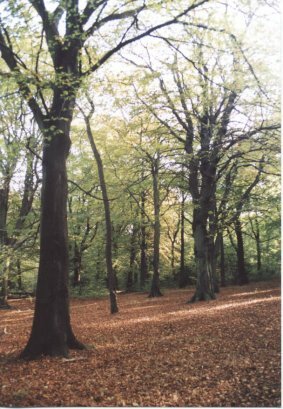 The site named above is an area of ancient woodland and an adjoining meadow. 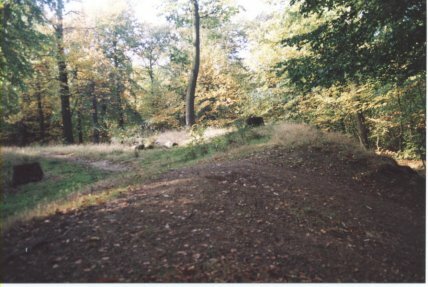 Within this area, there is an ancient earthwork which has been dated to the late Neolithic period. There are possible sarcen stones buried in the ground on this site. Also, Scholes Coppice is on a direct Ley Line with Woodhenge, (next to Stonehenge) and is a part of other sacred landscape alignments as well.